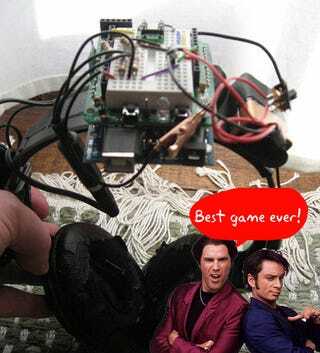 The arduino platform has been the basis for a lot of bizarre gadgetry over the years, and the audio ping pong project by Mike McCracken certainly stands up to the best of them. The game is essentially the classic Pong with one major alteration—instead of using your hands and eyes, the game is controlled with audio cues and head movements. When the headphones are on, the player hears a sound (the ball) that seems to be getting closer. In order to return "the ball" you tilt your head to one side or the other depending on which side the movement is heard. The challenge is to center the sound and return the volley. As the contest progresses, the speed increases until you miss the ball or you break your neck—whichever comes first. As you lie twitching on the ground, a buzzer and a light from the machine will mock your defeat. To discover just how stupid all of this makes you look, check out the video below.